The protest drew more than 2,000 people to Horseshoe Beach, one of the largest climate protests against coal in the NSW regional city of Newcastle. More than 60 people, including a flock of climate angels and Bill Ryan a 94 year old Kokoda veteran from World War II, have been arrested, charged and released for blockading the Kooragang Island rail bridge that is used for transporting coal to the port. 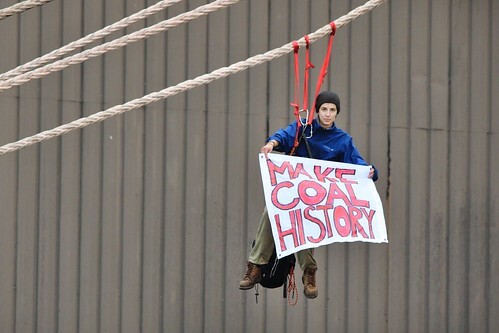 Another 4 people were arrested for locking on to coal terminal equipment and banner drop at the coal wharf. ABC reported that more than a dozen ship movements had been scheduled for the port, but none attempted to past the blockade. Last week it was announced that a cruise liner due to stop in Newcastle on Sunday had cancelled its trip. The Newcastle Herald reported that shipping schedules were adjusted so that no coal or other cargo ships moved in or out of the port for the day. They estimated the cost in the movement delay at about $20 million. 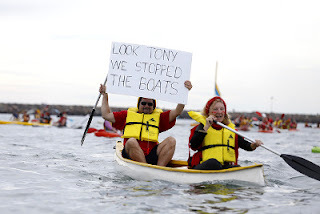 Activists set sail in a flotilla of kayaks and canoes, sail boats, catamarans and even surfboards to make a line across the harbour. On board the renewable-powered catamaran Gaia’s Dream, Midnight Oil’s Rob Hirst and Australian blues singer Ash Grunwald performed on the harbour for the crowds on the beach and paddling around. Pacific Island Warriors launched their traditional war canoes and also performed dances on the beach. Most of the arrests occurred when a crowd of around 70 people occupied the Kooragang Island rail bridge to the coal port terminal. The occupation was peaceful. Passive resistance was undertaken so that arrests were made one by one. Processing and charging those arrested was made on site, with people then released. 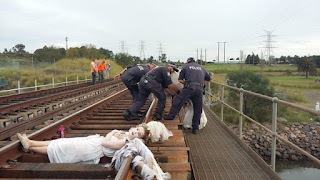 Dramatic images of climate Guardian angels lying on the tracks and then being arrested. The police had some trouble with the angel wings in carrying the angels away. 94 year old Bill Ryan, a Kokoda veteran from World War II, opted to walk when arrested. Prime Minister Malcolm Turnbull has now called a double dissolution election for July 2 for Australia, visiting the Governor General for issuing the writs around lunch time while the protest was occurring (The Guardian Politics Live). MPs from the Greens Party attended and participated in the flotilla blockade. "We are saying No More new coal mines if we are to make the transition to a 21st century economy and save the Great Barrier Reef" he said. 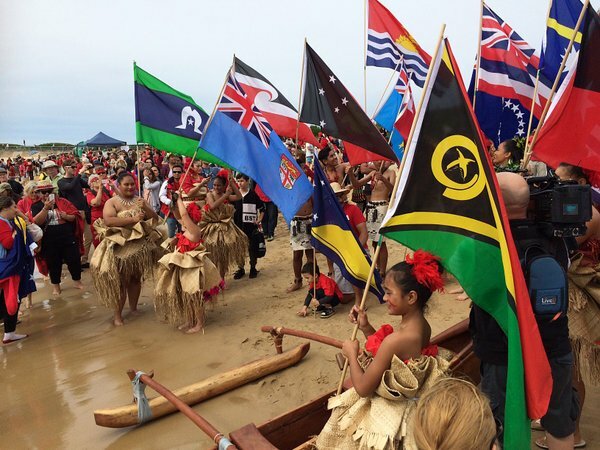 "We stand with the community on the first day of the election campaign. While you will see the two old parties standing with vested interests saying lets continue to dig coal out of the ground, to pollute the atmosphere, to make dangerous global warming worse, to lose the Great Barrier Reef, to lose that precious wilderness that we all so dearly love. And to hold us back from making that transition that we as a country so desperately need to make. We Know that the world is moving, we know the community is moving. We know that people around the world are joining together to say 'no more new coal', because more coal means more dangerous global warming." 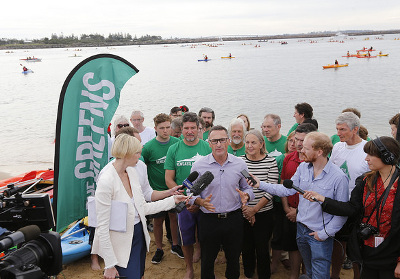 "The Greens as a party have never been in better shape" he said. "We have people knocking on doors, we have people ringing people up for their concerns, ordinary supporters and members just having conversations with people because we know that every conversation we have with people on the street, that is one more person likely to vote Green. The biggest thing holding the Greens back is that a lot of people still don't know what our broad suite of policies actually represent." "Our campaign will look like: working with the community, standing against vested interests, saying no more new coal, let's make the transition to a 21st century economy and let's get this country moving in a direction that is more sustainable, more prosperous and more caring. "We have seen the two old parties backing huge tax cuts. Tax cuts that mean we can't fund our hospitals and schools. We are saying end those unfair tax breaks. We haven't got the money to look after schools, hospitals and infrastructure and looking after ordinary people who are doing it tough. "What we are taking to this election campaign is a clear position on some key issues: tackling dangerous global warming; a bit more decency and compassion on those innocent people who are coming to us seeking protection, who want us to look after them because they are enduring suffering thanks to the conflicts that we contributed to. We are a party that is saying, let's tackle income inequality: let's make that growing gap between the rich and poor - let's bridge that gap - and lets start raising money from the big end of town, end those unfair tax breaks...that's what we offer in this election campaign." The Labor, Liberal and National Parties are all silent on the impact of export coal, because the emissions of this coal is allocated to the emissions profile of the countries that burn it. But Australian production is being encouraged to grow and expand. 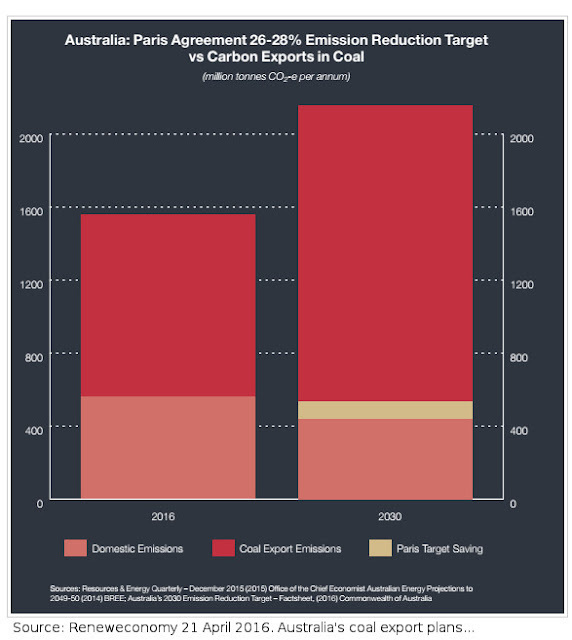 This one graph shows the relative impact of Australia's low emissions target of 26-28 per cent cut by 2030 in comparison to the projected growth of export coal. The blockade lasted from dawn to dusk and had a party atmosphere. 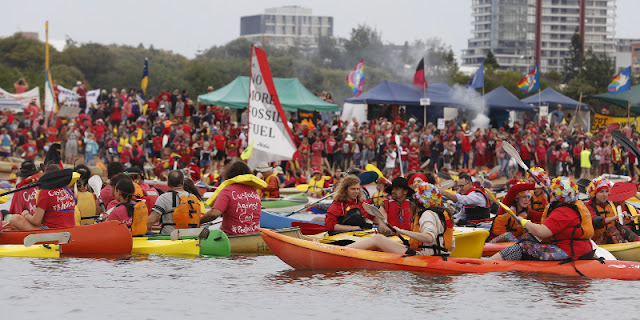 It was part of global protests primarily organised by 350.org and targeting coal and fossil fuel assets to force their phaseout and closure and an increase in a rapid transition to renewables powered low carbon society. 300 Activists In Wales closed down the largest opencast coal mine in the United Kingdom on Tuesday. In the Philippines 10,000 people marched and rallied at Batangas City agaijnst construction of new coal fired power stations. Labor Opposition Leader Bill Shorten spoke to the media after the announcement of the election including saying: "I will fight this election for real action on climate change." The Labor Party released a positive policy to combat climate change, but with no mention in the policy of no new mines or phasing out export coal, or the $7.7 billion in fossil fuel subsidies each year, or to lift pre-2020 ambition. The conservative Liberal National Party Government lead by Prime Minister Malcolm Turnbull is running on it's existing low target climate policies and poor environmental record. The Government handed down the Federal budget during the week with the Treasurer failing to mention climate change once or the necessity to transition to a low carbon economy in his speech. Shorten's budget reply made a point of differentiating the Labor Party on stronger targets and climate action. Australia's Environment Minister Greg Hunt signed the Paris Agreement in New York on April 22 and pledged that Australia would ratify the agreement before the end of 2016. In the normal course of events, a number of coal ships would have left the port on the mid-morning high tide, and the protests on the rail lines will have similarly disrupted coal trains from the mines. Whatever coal industry leaders think of the protests, they must realise that their industry is losing its social licence. Passing tougher anti-protest laws, as the state government has done, is not the answer when the public has such genuine and logical disquiet.